Christmas projects are done, gifts are given, and decorations are put away until next year. It is a new year and with it come all kinds of quilting possibilities. The first project is one that has been waiting in the wings for awhile. In fact, I wrote about it recently in a blog post entitled New quilting project; Tweak it until it speaks to you. I wrote about the latest quilt-as-you-go project from Leah Day, free-motion quilting mentor for quilters around the globe. As I pointed out, this year's quilt along will be the Dancing Butterflies quilt. I eagerly signed up, but decided to use pink flamingos instead, but I was enamored with the pinkness of her project. I carried that through, but instead of purple tones, I am using aqua to compliment a room in our home that just so happens to be themed, pink flamingos. A funny thing happened to my quilting fabric though. First, I ordered a couple of yards of aqua batiks from fabric.com, one of my favorite online go-to quilt shops. 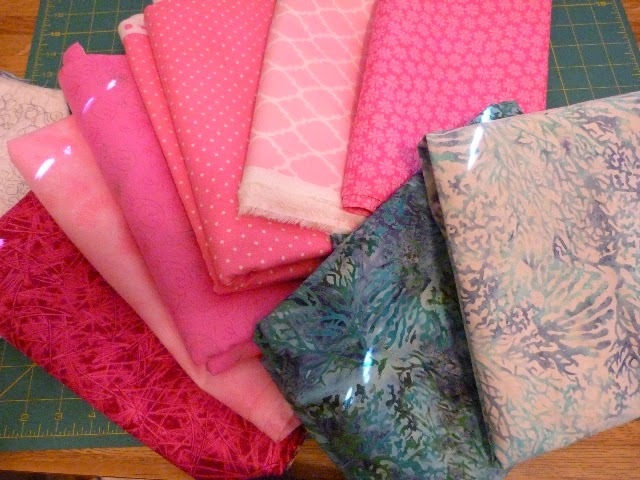 A couple of days later, I ordered several yards of pink fabrics from a different source--Hancock fabrics--taking full advantage of Christmas sales. When my first package arrived, it was the wrong fabric. How devastating! I called right away and was told that I may keep the fabric that was sent and they would get mine out as soon as possible. Now that is customer service. That was just Friday. Today is Monday and both packages arrived. Could I be more excited? Needless to say, I am almost as excited as my cat, Ryan. I'm not sure if it is the soft, comfy cloth or the box that gives her the biggest thrill. Perhaps it is a combination of both. At any rate, this is proof that new fabric is always a good thing. Even though I picked this out online and the colors are always pretty true, it is always a thrill to see them (and feel them) in person. I couldn't be more pleased with these. And, I can't wait to get started on this quilt. Fortunately, I ordered just a little more than I will actually need. I am starting to visualize this quilt and can't wait to see it done. There is surely a long way to go before that happens though. Fortunately, I had a little fabric on which to practice. The blocks should look something like this. I haven't yet decided how I want to do the applique, satin stitch, as the patterns suggests, or some other method. Here I just hand appliqued the bird and then outline quilted around it. 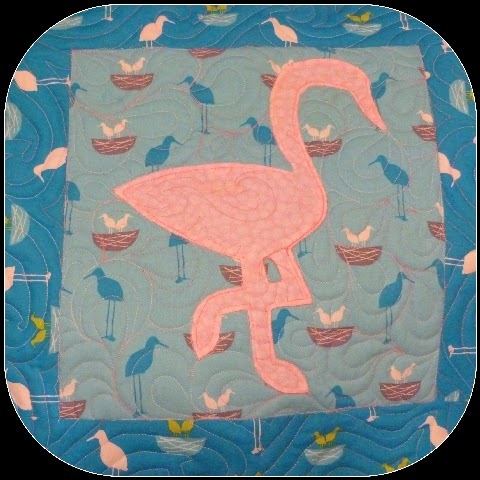 I also have two shades of pink and aqua thread, so I plan to use contrasting colors to quilt both the background and the bird. I'm also not sure if I want to make his beak and feet a different color or leave them as is. Hmm! My first inclination is to leave it this way, but I'm open to all suggestions. Quiltmaking is just so filled with decisions. I want to take my time to make sure I make the right one. The only thing I know for sure is, that I am going to love this quilt. It is going to fit right in to this room. When I first saw Leah's latest quilt along project, I was drawn to it. Her Dancing Butterfly quilt was done in pinks and purples, my all-time favorites. Though I liked it, there was just something I couldn't put my finger on. When she offered a discount on the price, for Black Friday, I jumped at the chance. 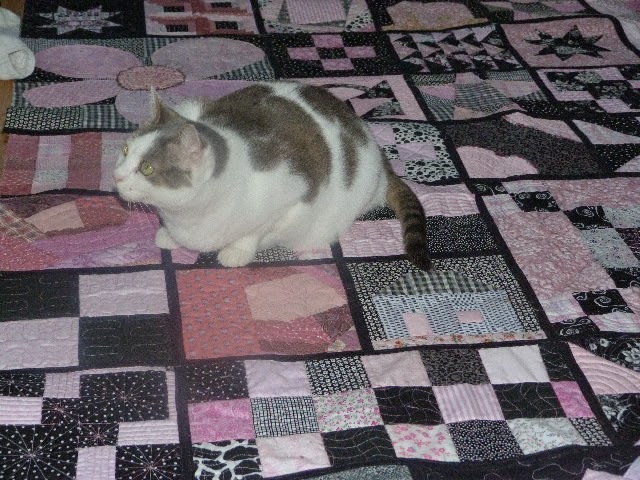 I so enjoyed the last quilt along project with Leah Day, the one that resulted in my "Black and white and pink all over" quilt, at right, under the watchful paws of my girl, Kasey. I love #quilting. Leah Day is a wonderful teacher who has perfected her skills in free-motion quilting and probably any other thing she endeavors. The beauty though, is that she shares her knowledge with anyone else who is interested. This makes her an excellent quilting teacher, who has already taught me so much. In addition, I like her attitude and demeanor. Who wouldn't love a woman who has the patience to teach her own husband to quilt? Josh was a big part of the Building Blocks Quilt Along, as he learned the skills right along with the rest of Leah's students; students all around the globe. I cannot imagine my husband having the patience to learn to quilt, or me having the patience to teach him. But these two are obviously special people and wonderful partners. It is a pleasure to support their efforts wherever I can. Since this quilt along was such a positive experience, I really wanted to participate in her next project, which was also a quilt along, but with applique added. That is a skill I have yet to master, so I thought it might be beneficial to join in. I loved the beautiful batiks and the colors she used. I am not normally someone who does exactly as I'm told, but I wanted to make this quilt just like she did. If she would have offered a fabric kit for sale, I would have bought it hands down, even though that isn't something I would normally do. But since that wasn't an option, I found some fat quarter batiks on sale for a ridiculously reasonable price from Connecting Threads. I would have bought them anyway because they were beautiful, but I figured on using this delicious fabric for the butterfly project. Then I read the materials list. It called for 2/3 of a yard of several fabrics. I only had fat quarters. I didn't know if it would work, so I decided to rethink all my options. I downloaded the pattern and examined several of Leah's videos. This looked like loads of fun, but something was bothering me. I attributed it to the hard decision to pick out just the right fabrics and thread colors. In the meantime, I had ordered new quilting software Electric Quilt 7. I had EQ5, but it was so old and obsolete. I am a frugal quilter, so I really balked at the price of this software, at $189. That was too steep for my blood. Then, I found it on sale for $30 less on Amazon, as another Black Friday deal. I knew it would never be any cheaper. So I reasoned that it would be a nice early birthday present. Well my birthday is tomorrow and I got it two days ago. Not bad! I started playing with the program. One of the best ways to learn new software is to just start using it. I decided I would try to mimic Leah's butterfly quilt design. I figured it out. Learning new software isn't much fun if you can't tweak it, so I changed the butterflies to pink flamingos. Hallelujah! That was it! That was what was bothering me. It wasn't the decision about fabrics. it was that I wanted to make a quilt that spoke to me. Every quilt I've ever made has spoken to me. What I really wanted; what I thought I really needed was to make a quilt that fit into our newly-decorated enclosed back porch. 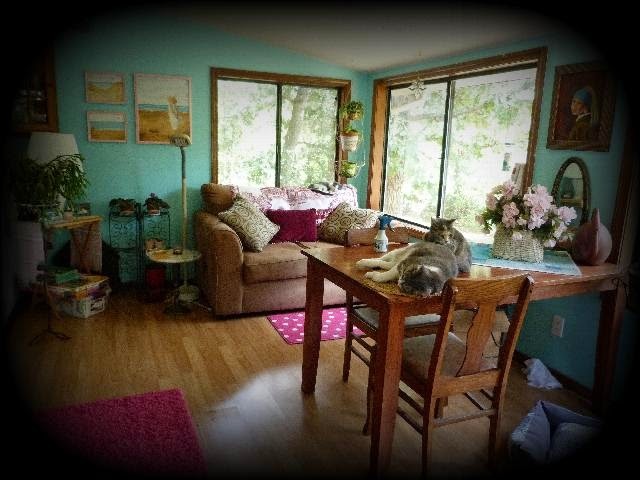 Just this year, we installed a laminate floor and painted it turquoise using a pink flamingos theme. That's what I wanted! It was easy to use EQ7 to turn Leah's butterflies into my pink flamingos. I can still do Leah's quilt along in every other way except for the animal depicted. I still have decisions to make, such as applique or paper-piecing, as well as fabric and thread color choices. And there may still be some tweaks to the design, but it should be easier now though, since I have a great idea where I'm going and where I want to end up. I love everything about the quilting process, so to pick fabric shouldn't have been a hang up. This is like a lightbulb went on. I believe this quilt really did speak to me. I just love the color yellow with all its tones! Nothing makes me happier than solving problems, especially when it involves #quilting. I have no idea why yellow is such a difficult color these days. My bathroom is yellow. My bedroom is yellow. For years, they have been yellow. I like waking up with sunshine and yellow mimics that beautifully. Finding throw rugs and other items like bedding, for that matter, is really difficult. I'm not sure when that happened. 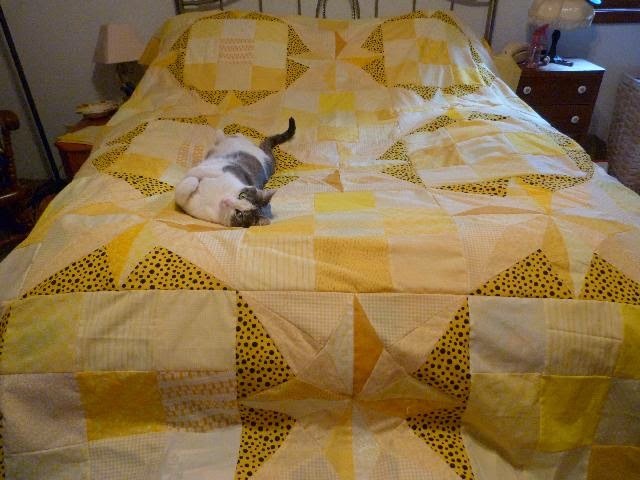 I solved the bedding problem when I made a yellow quilt. Most recently, I even resorted to replacing an old throw rug--you know that shag rectangle with the rubber backing--with a white one. It served its purpose, keeping me from flying out of the shower with my wet feet, but I hated it. It was hard to clean, even though it was only used when stepping out of the shower. It was a hair and fuzz magnet. Yes, I have cats. One day not too long ago, I found a yellow throw rug at Big Lots, but there was only one. Ideally, I wanted two--one for just outside the shower and one for the below the sink. No luck, so I took matters into my own hands. The other day I decided to make a little quilted rug for that area. The design was simple. 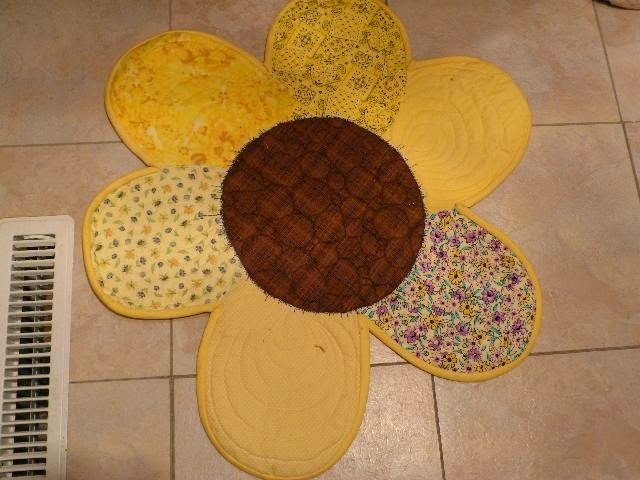 I made a similar flower in my last quilt--off the top of my head. This is probably right out of that book, All I really need to know I learned in kindergarten, except I never read that book. Anyway, it didn't take very long to cut a few pieces, sew them together and quilt it. It was done in a day from design to quilting. I wish that was where my story ended. I was a little apprehensive about sewing the binding, since those are pretty sharp curves to deal with. So, I woke up the next morning, all ready to cut some bias strips. When I inspected my handiwork, my heart sank. I had sewn the brown center over the pedals without taking out the pins. Sheesh! If there is one thing quilting has taught me, it is how to deal with my many stupid mistakes. I seem to make them all the time. There was no way to unsew all the quilting, so the only option I had was to cut through the back to pull them out. They were bead head pins, so at least I could feel where they were. At first I tried a wire cutter, thinking I could just leave them inside, since they would be beneath two layers of batting. Then I thought about putting the tender soles of my feet onto a broken pin that was still attached to that bead. Finally, I got out my scissors and seam ripper and did a little surgery in six places on the back of my quilt. The holes are so tiny, they are hardly noticeable. I will cover them with a non-slip backing, which is necessary anyway. The binding wasn't bad either, so I'm glad to have another project in the books, and a rug in front of my sink. Last summer, I wrote a blog post entitled "It is all about the tools." I referenced the benefits of my new Dritz Petite Press mini iron. Today I'd like to expand on the tools theme to add my latest acquisitions--a new adjustable height task chair and a sewing extension table. 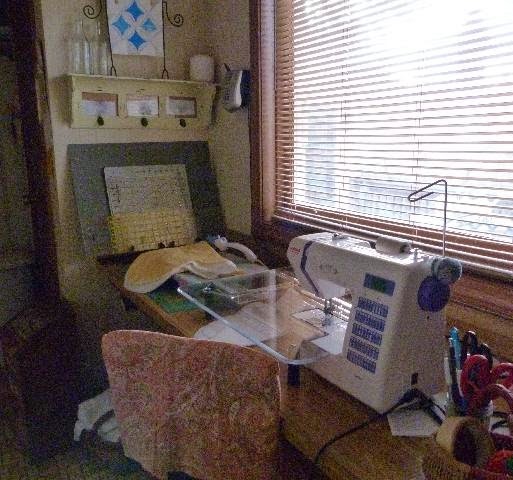 I don't have space in my house for a sewing room, but I do have a dedicated sewing area off the kitchen. It is sometimes a challenge to work in a small space, but I manage pretty well. Probably the hardest part is keeping the area neat and clean. I just finished my latest quilt, so there were threads and scraps and fabric yardage everywhere. I had bags of this and bins of that littered all over the place. There is little hope of keeping this area tidy while I'm in the middle of a #quilting frenzy. That is what I call the time when I'm finishing up a project am so busy I forget to eat. Fortunately I have a husband who cooks. During those times even my coffee gets cold because I'm too engaged to remember to drink it. But once that time is over, I actually enjoy the cleaning. 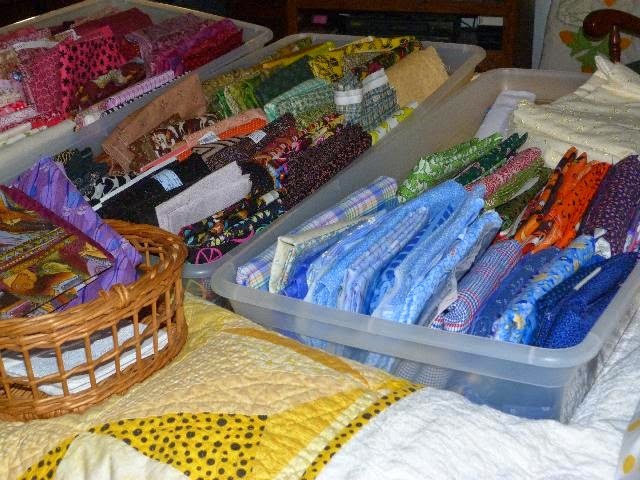 I like folding fabric, sorting into sizes and colors, and then putting it all back into flat storage bins I keep under the bed. That is the primary place where my stash is kept. And those bins are invaluable tools. My sewing machine is new and I want to keep it looking good, so this is also a good time to clean the surface of all the thread and dust as well as all that lint that collects near the bobbin. It is amazing how much builds up there. I also like to change the needle and rotary cutter blade. Quilting just isn't possible without those essential tools. Besides, I love being ready for the next project. Since this new chair has black fabric on the back and seat, I made a covering for it, one that will not be a magnet for white cat hair, since my cats love my sewing area. 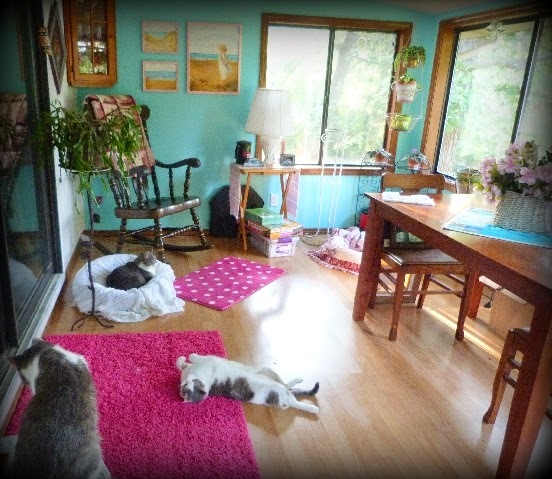 That window faces south, so the sunshine, especially at this time of year is attractive to those with paws. 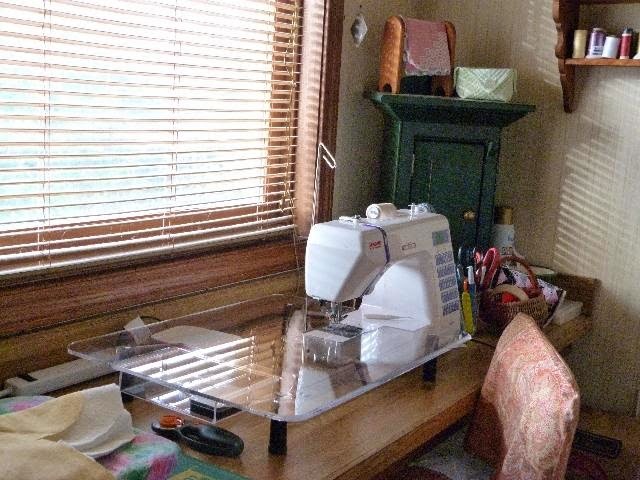 My new sewing table, made by Sew Steady, was custom made, ordered through my local sewing machine dealer. It is a tool that extends the base of my machine, mimicking a sewing cabinet. The machine is flush with the table, so I'm hoping it will help to support large quilts. It hadn't arrived in time to finish my last quilt, but I have no doubt it would have made the process of binding all those individual blocks together just a bit easier. Sewing all those seams was a bugger, and gravity was not my friend. I also hope this table will inspire me to try something new--to quilt an entire quilt--rather than simply blocks at a time. I've been thinking of doing this for some time now, but until now wasn't quite ready. I am now. As it turned out, this new chair, a typical office chair with no arms, is a necessity since the height of the table requires me to sit higher than I could with the chair I had been using. It also allowed the fourth dinging room chair to go back to where it belongs. Tools are meant to help us be more productive. Although there are many things I want, I'm happy to settle for the things I need, those things that make me more efficient. Saturday night concluded another epic quilting journey. I doubt there is little that is more satisfying than finishing a quilt. I finished this about 7 p.m. which is way beyond my quilting comfort zone, but the power went out at our house for a couple hours. The idle time gave me a while to contemplate the quilting journey I was just wrapping up. 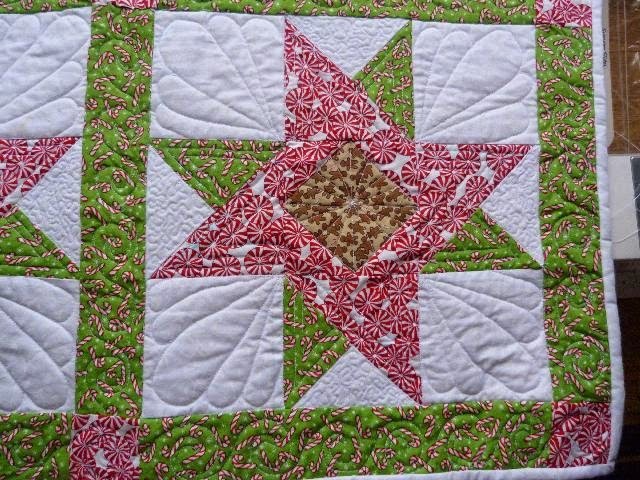 This quilt is from the Building Blocks Quilting project sponsored by my FMQ (free-motion quilting idol,) Leah Day. 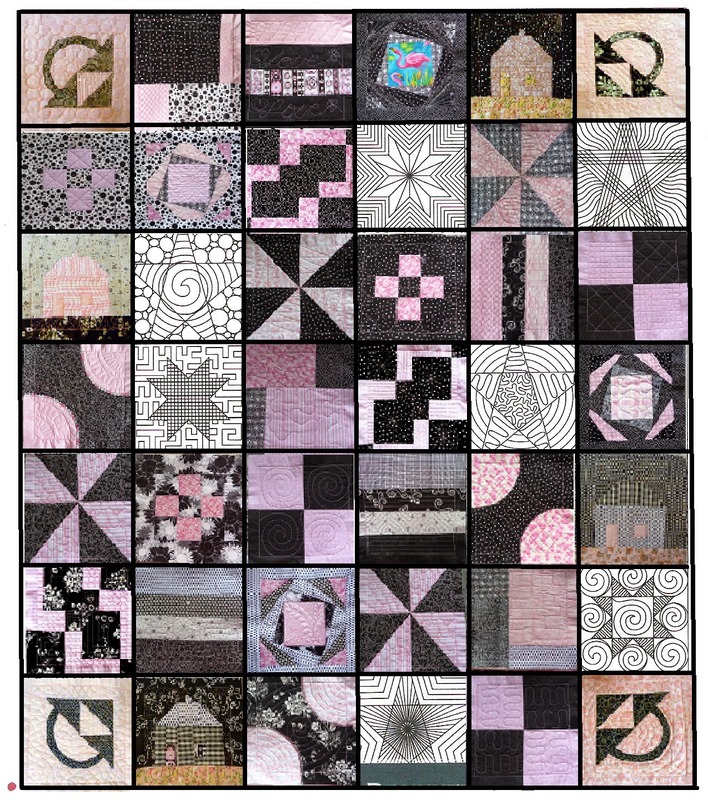 Her pattern for this quilt-along consisted of 42 blocks that focused on both piecing and FMQ skills. When I began the class, I already had some FMQ experience, but I always like to learn new tips, ideas, and techniques. I also relish the opportunity to practice my skills. There are some that I just can't quite master, like interestingly enough--the most basic skill--stitching in the ditch. I'm terrible at it. I need more practice at it. The pattern called for two solid fabrics, so the stitching would reveal mistakes as well as show positive progress. Many of the gazillion people who signed up for this quilt-along, from all areas of the globe, had never done FMQ before. This is my third FMQ quilt however, so I'm not a complete novice, though I still feel like a beginner in many ways. 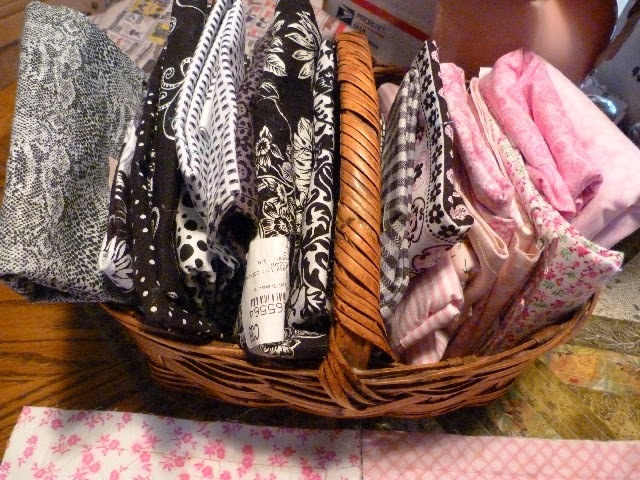 I had always wanted to do something with black and white fabric, which I had been collecting. So I decided early on to use a variety of that with my other favorite color--pink. To be honest, I'm not sure pink is my favorite any more. I've grown to love ALL colors. I also made a decision midway through that I wanted a bigger quilt. I reasoned that since I had never worked with varied-sized blocks before, I wanted to give that a try. So when everybody else was finished with their 42 eight-inch blocks, I was still at it. At this point, followed the lead of one of my fellow quilters on the Building Blocks Facebook page, that had put tiny pictures of her finished quilt blocks into the pattern grid. It was a good measure of our progress, clearly showing the yet-to-be completed blocks. I loved the idea so using Windows Paint, I took the pictures I had already taken of my blocks, resized them, and copied them onto the pattern. This is what it looked like. I then cut out each of those squares and individually pasted them onto graph paper, moving them around and adding a few double-sized or half-sized blocks. Because there were so many 8" x 8" blocks, I thought just a few additions would give the quilt added interest. I decided on double-sized blocks. Then I had to decide on a pattern for those 16" x 16" blocks. 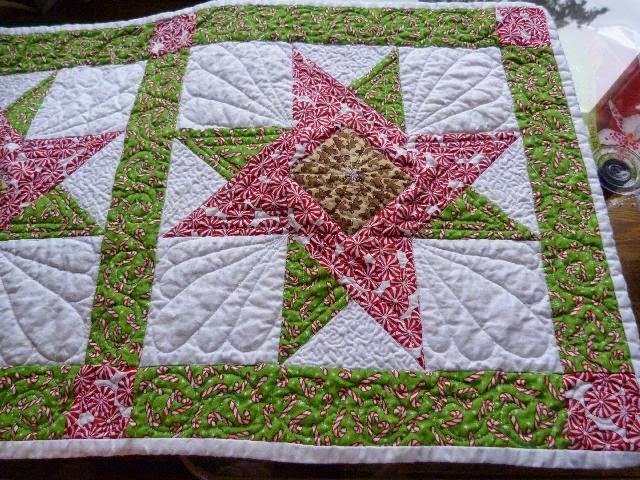 I chose my signature block, the Double Star, a Dresden Plate, a Chain block, and a flower block, all of which were in other quilts I've made. I made a couple of 4" x 4" blocks, one that was 8" x 16", and even filled in with a couple more standard 8" x 8" blocks. My-six by -seven block quilt had grown to almost twice the size of the original. It was now 7 blocks wide and 10 blocks long. Finally, when all the blocks were done, and I laid them out and took a digital picture of the final layout. At the same time, I tried to vary the layout of the back of the quilt. The printout was my final diagram. Then I set out to join the blocks with the QAYG (quilt-as-you-go) method. This was particularly challenging for me. I never did binding by machine before. I had a really hard time keeping my seams straight at the same time as trying to hold the fabric in place. I used my walking foot, but I'm not sure if that was a help or hindrance. It seems as though this took arm strength to manipulate that heavy quilt. I found it to be exhausting. 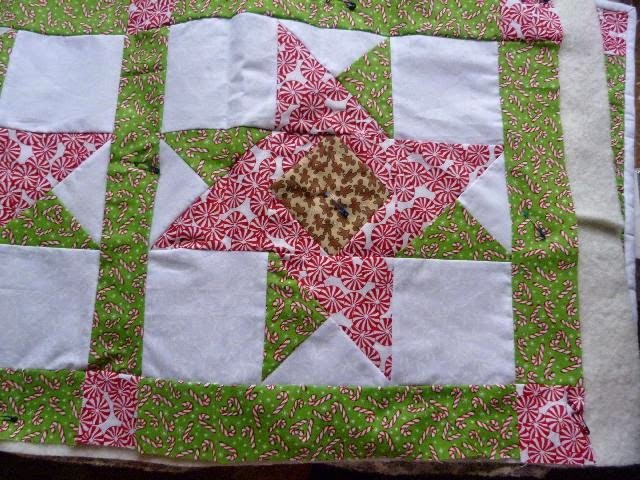 The last quilt I did used 12" blocks plus a sashing around them which resulted in far fewer seams to bind. With the varied sizes, I had to also figure out the proper order to sew the blocks. It was not as easy as just sewing all the verticals and then all sewing all the rows together. Once I figured it out, I labeled each grouping of rows. For example the first row was easy; one after the other. But for the second row, I marked the first 2 blocks as row 2 A because they had to be sewn to the top of the 16" flower block. The next 3 blocks were labeled row 2B because they had to be sewn to row 3B before they could be attached to the huge star block, and so on. The figuring wasn't difficult, but following my own directions were a bit iffy. I got pretty proficient in seam ripping. More than once I sewed the rows incorrectly and had to flip them and do it all again. It took three full days and part of the fourth to finish this part of the process. When I finally reviewed the method for making a two-toned border, I had far fewer problems. In fact, this was the first time I bound a quilt without having to look up the directions on how to finish. I joined the binding strips on the first try. Taking this quilt out of the dryer and seeing that nothing had fallen apart, the colors hadn't run, and all the quilted areas were all poofy and quilty-looking, I was a happy camper. If fact I am anxious to start the next one. 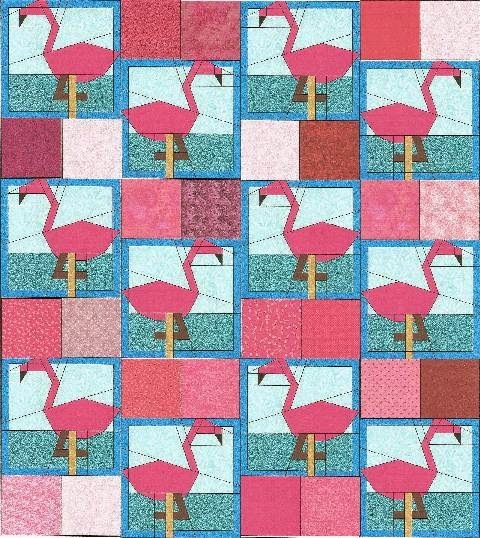 See this and other quilts from the Building Blocks Quilting Project here. My quilting pursuit has led to an insatiable desire to further challenge myself. And, there are so many possibilities. It seems there are always new skills to practice and new ideas to ponder; there is always something to try that I haven't done before. From what I can see, quilting has no bounds. This is such an exciting time to learn, not just about quilting, but whatever our interest. It is easier than ever before to get answers to each question that comes to mind. Just Google it. Someone has probably asked the same question already to which multiple answers are available. For me, and my latest quilting obsession, my questions are often satisfied by the abundance of You Tube videos filled with instruction and inspiration. I'm so grateful to the many artists that have come forward to share information and techniques with the rest of us. My most recent quilt, 'Stars on Point,' was more to me than a comfy coverlet for the bed. It was a learning experience. Moving bravely away from monochromatic projects; This is the first time I designed a two-color quilt. More precise piecing; There is no end to the need for practice matching points and keeping seams straight. Precision is necessary in cutting, sewing, and pressing. Practicing paper piecing; Some of these blocks were created using paper-piecing. I hated it when I first tried it. Now, I'm seeing how useful it can be and am anxious to further explore this technique. Practice at free-motion quilting; I will always need to practice this skill. Thankfully, I have noticed an improvement since I first started. I am now more comfortable free-motion quilting. This is the second quilt I have done this way--as a quilt-as-you-go (QAYG) project, where the quilting is done before assembling the quilt rather than after. I'm hooked. I've learned that quilting is more than a way to anchor the piecing. It is a design element all its own, enhancing the look of the design. First steps at modifying and enhancing a design; This was a Block-of-the-Month (BOM) project. When the year was over, there were 12 blocks that if sewn together and quilted traditionally would have made a perfectly acceptable and beautiful quilt. But I wanted more. So, I decided to set the blocks on-point, added 6 additional blocks and matching side triangles, to form a secondary pattern. Because the blocks are the same and form a linear pattern that travels across the quilt, they serve to draw the quilt together providing unity to what would have otherwise been just random blocks. Laying out blocks on point, complete with figuring set in triangles; I have never done this before and didn't have the first idea how to start. Carrying out the desired pattern into the set in triangles; I had no idea how to do this. Math equations, triangles and me, normally do not get along well, but I muddled through it. Practice with Electric Quilt 5 (I bought it years ago and never used it); EQ5 saved me by allowing me to draw a template and figure the size pieces to cut for the setting triangles and corners. Designing a pleasing patchwork backing; I wanted this quilt to be yellow and white gingham on the back, to be reversible, so I needed to follow a pattern on the front and on the back at the same time. I took digital pictures of the layout to help with that task. I am currently working on Leah Day's Building Blocks Quilt Along, which I have also mentioned previously in CHQuilts. I've named it simply, "Black and white and pink all over." The work on these quilt blocks is almost finished. The diagram at left isn't current, since I've already completed three of the six remaining blocks. I've decided however, that it might be fun to challenge myself on this project as well. The blocks are going to finish at 8" x 8". There are 72 of them, so the quilt will be lap size. I've decided to add a few blocks to it. I have never made a quilt with varied sized blocks before, but that is my aim. I have no idea if this is going to work, or if it will look good until I lay it all out. I will do keep my fingers crossed. To figure out dimensions and what I still need to accomplish my goal, I printed out this diagram. I cut out the individual blocks and pasted them onto graph paper, drawing in the additions. So far, I've sewed a couple of them. There will be a few 16" x 16" blocks, a some 4" x 4's" and perhaps a few 8" x 4" blocks. My first endeavor was to add my favorite block--the double star block--which I refer to as my signature block. I have made several table runners using it and I have also put it into my last two quilts. This will make the third. I just love everything about this block and I never tire of making it. I did, however, have to figure out how to cut the pieces to the right size since the instructions I have is for a 12" x 12" block. So, once again, I used EQ5 to draw the block and print out the proper dimensions. After many hours of trying to figure out the program again, it worked! This block is 16" x 16," so it will be one of three large blocks in the quilt. I've pieced these three blocks, (left)--the second pic contains two 4" x 8" blocks--that will be used for fillers in this quilt. I haven't quilted them yet, but am thinking of an overall stippling design. I could probably stipple all day long. That is real progress, since the first time I did this overall meander stitch, it was anything but comfortable. Now, it feels perfectly natural. I enjoyed making these blocks. It was a day of mindless sewing as I was practicing making flying geese by sewing triangles together. That worked pretty well and this was the result. I was able to use up some scrap fabric, which also makes me really happy.